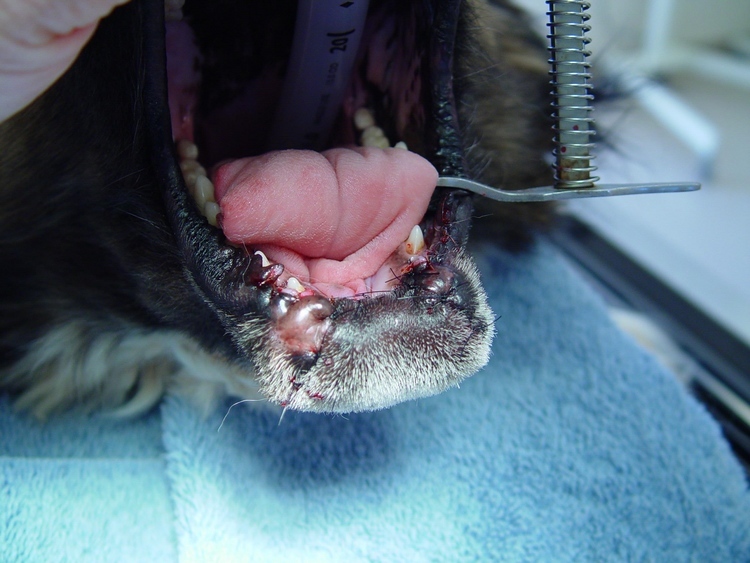 A diagnosis of oral cancer can be devastating to the canine patient as well to the owner. Images of pain, difficulty eating, facial swelling, and ultimately euthanasia comes to mind. This is NOT ALWAYS the case. W ith early detection, modern diagnostics, new cancer protocols, and advanced surgical techniques successful outcomes are possible. 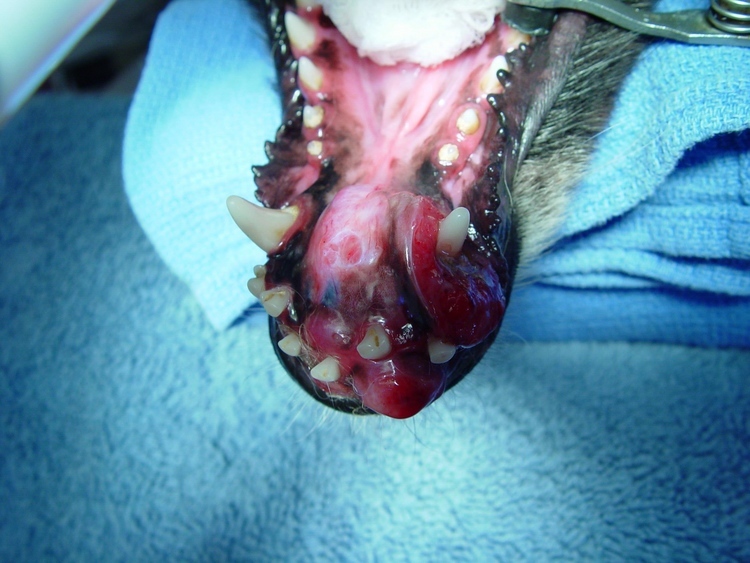 S quamous Cell Carcinoma (SCC) is the second most common oral neoplasia in dogs and the most common oral tumor in cats. 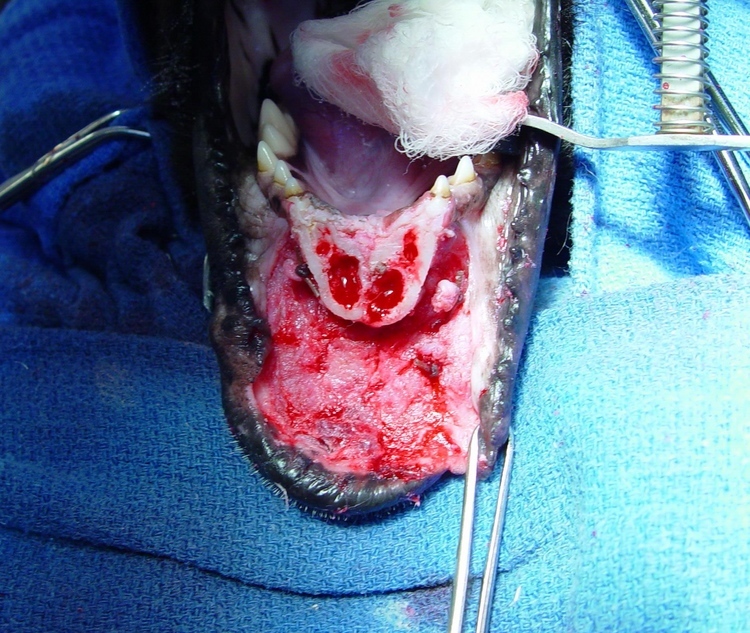 Cats carry a more grave prognosis when oral SCC is diagnosed. S andy, a six year old Australian shepherd mix, was referred to our practice for an oral mass evaluation. Her general health was deteriorating due to discomfort and the inability to eat. Sandy's initial lab work and chest radiographs were in normal range with no apparent lymph node enlargement. In most cases, a CT scan and incisional biopsy are recommended to confirm the diagnosis and extent of the mass. 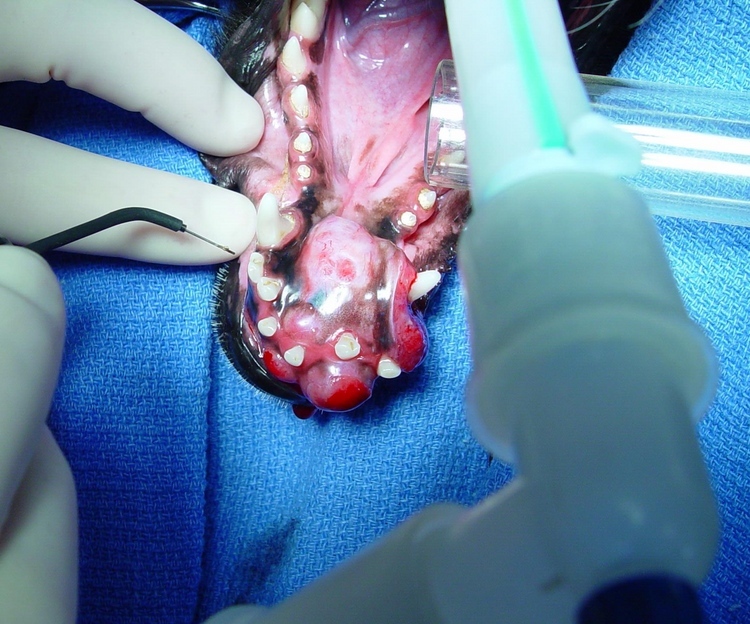 The owner was aware of her options, but elected to have the surgery performed immediately. SCC was our initial impression. 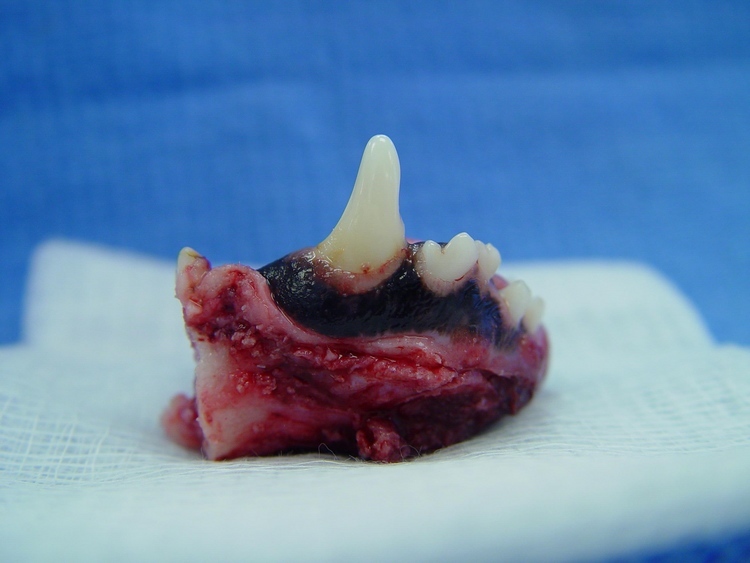 The entire rostral mandible was submitted for histopathology and the final diagnosis was Oral Squamous Cell Carcinoma. 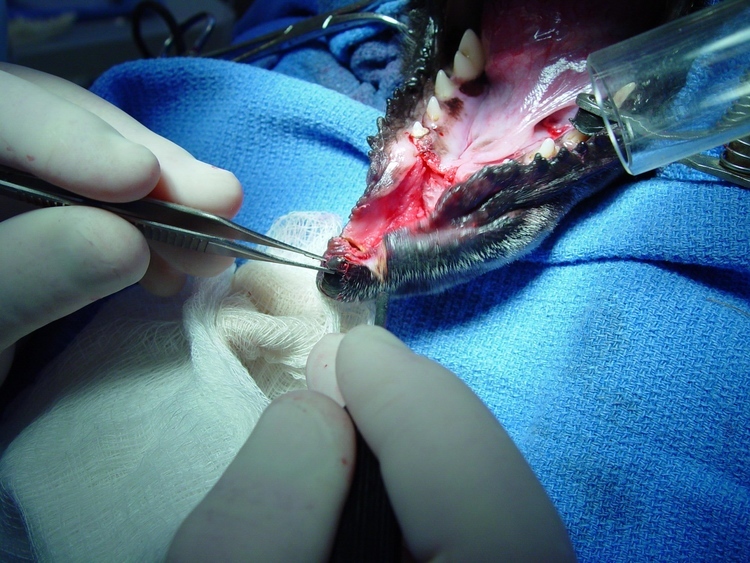 Removal of the entire mass and rostral part of the lower jaw (Rostral Mandibulectomy) is the treatment of choice. 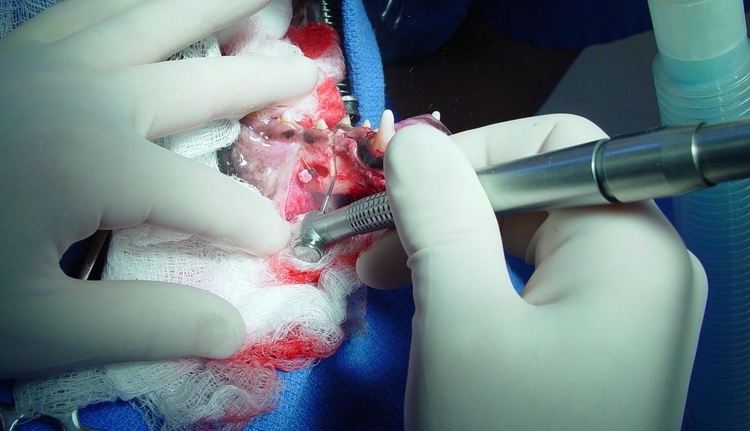 Healthy tissue is dissected away from the mandible with a radio-wave surgical unit and a bilateral osteotomy (bone cutting) distal to the tumor is completed. 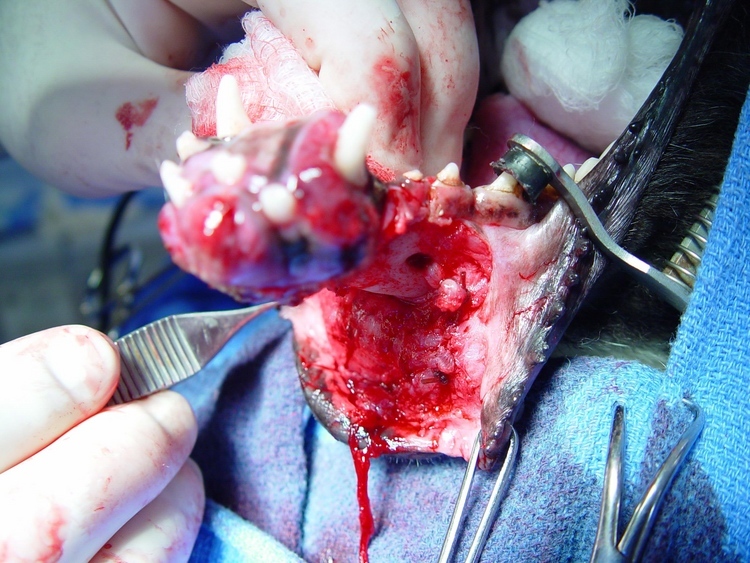 The rostral mandible and tumor were removed intact. A special flap was designed to cover the defect. 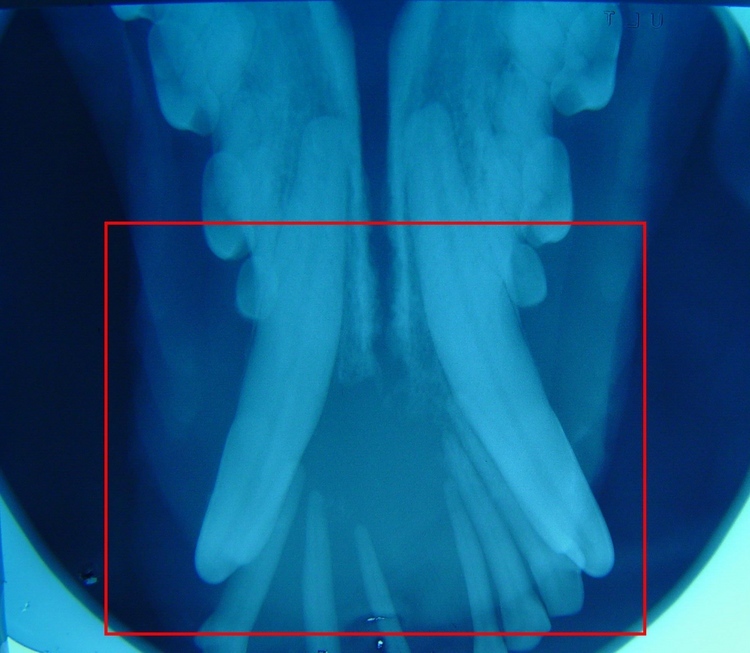 C ertain oral t umors in the rostral part of the mouth have a good prognosis with surgery and/or irradiation, while those in the distal part of the mouth (throat and tonsilar area) are highly metastatic and carry a poor prognosis . O ur patients do very well adapting to the rostral mandibulectomy. Eating and drinking present very little problem. We continue to monitor for any regrowth or movement of tumors to other areas (oral, lymph nodes, and chest.) "Sandy" continues to do well 6 years post surgery.